a tour of Ohio Caverns near Bellefontaine. Sections of a cave system that haven't before been open to the public will be available for tours in a couple of weeks in west central Ohio just in time for the summer season. Visitors to Ohio Caverns in West Liberty still will be able to take the tour that has been offered since 1925 at the caverns known for their array of colors and abundant stalactites and stalagmites. But beginning Memorial Day weekend, they also can choose a tour providing more historical information about the cave and a shorter one with access for the disabled -- rare in caves because of the often rough terrain. The sections formerly closed off by debris and mud will make the existing tour and the historical one each about a mile long, increasing the amount of surveyed passageways to 3 1/2 miles. Workers started clearing the thick clay-like mud in the formerly closed sections in 2007. "You could crawl through the areas, but you couldn't walk in them," Ohio Caverns owner Eric Evans said. The caverns running underneath a 35-acre park in Logan and Champaign counties were formed thousands of years ago when an underground river cut through limestone, forming large rooms and passageways. Mineral deposits created highly decorative cave walls stained with red, orange, blue, purple and yellow in addition to the more traditional brown, black and white. 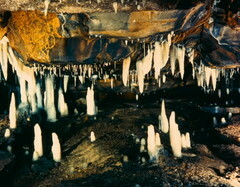 The caverns were discovered in 1897 by a farm hand when a 30-foot deep sinkhole opened up after heavy rain, Evans said. Visitors were drawn to the thousands of stalactites, stalagmites and other formations and took lantern-lit, self-guided tours in the early 20th century. The 45-minute formal tour offered for almost 90 years takes visitors past formations such as the Crystal King, a 400-pound white stalactite almost five feet long and more than 200,000 years old, and the Palace, featuring translucent crystals. Other rare formations such as helictites, which resemble straws, hang from the ceiling in unusual twisted shapes. Rare dual formations feature reddish iron oxide on top of pure white calcium carbonate, with the colors never blending. The caverns are open all year and typically draw about 60,000 visitors annually, said Evans, who hopes the additions will boost attendance by another 20,000, at least the first year.